Quantic Dream's David Cage is done with the business of death and wants to move his unique videogame style into other areas. With Heavy Rain already receiving positive reviews and about to hit stores next week, what could be next for developer Quantic Dream? Definitely not another game about a serial killer, according to studio head David Cage. In an interview with Eurogamer, Cage reveals that any further games from his studio that are not really going to be games will be of a genre other than thriller. "I'm interested in triggering emotions in this interactive medium, this is exactly what I believe is my mission. But maybe in different forms: I know one thing for sure, it's that Heavy Rain is the end of my personal trilogy trying to tell the same type of stories with serial killers and stuff, in the thriller genre," he says. Quantic Dream's previous two games were Omikron: The Nomad Soul and Fahrenheit/Indigo Prophecy. I haven't played Omikron, but Indigo Prophecy was definitely a thrilling appetizer for the type of game Heavy Rain has become, aside from some very annoying QTE sections (the bugs in the office are one example). Cage then teased that nearly anything other than a thriller could be next: "Tomorrow, using exactly the same interface and the same writing technique, we could have a comedy. We could create a tragedy. Maybe my fantasy is one day to create a story from Shakespeare using this format, which I think would be a huge challenge but would be very interesting." Shakespeare for the PS3? It doesn't sound that far-fetched, with the recent release of Dante's Inferno. To push R1, perchance to dream? Even more interesting is that Quantic Dream could create a multiplayer interactive-not-a-game-thing someday too. When asked about the possibility, Cage replied: "Yes, I think it's possible" but that it would be "incredibly challenging." Another idea in the air involves the use of Sony's upcoming but still not officially named motion controller. Quantic Dream actually invented their own version of a motion controller for use in Heavy Rain, but it ended up sticking with the Dual Shock controller's features instead. Still, Cage says: "We have a lot of interest in this motion controller, we start to play with it, and yeah, we definitely want to do something with it." For now, we should start thinking about the present and prepare for Heavy Rain. 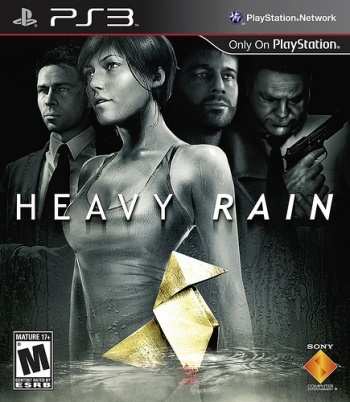 Cage reveals that in Heavy Rain: "There are many different endings, I think there are 23 epilogues actually in the game. But it doesn't mean that there are 23 endings, because there are many different paths leading to different endings, and there are combinations of paths and consequences offering more choices leading to more consequences... so the way it's written, it's not like there's one branch here, one branch here and you end up with two endings." Completionists are going to go mad trying to find every little piece of the game for sure. Me, I'm just going to kill everyone off, and watch the Origami Killer continue his spree of death and paper folding forever.